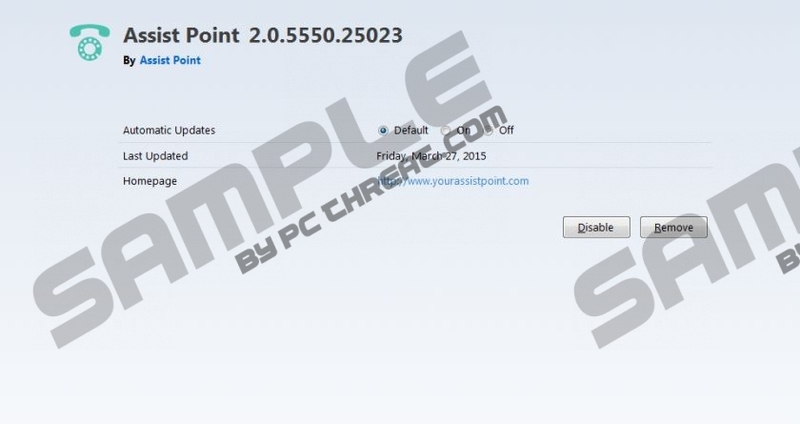 Assist Point is a program that should, just like its name suggests, improve your web browsing experience. Do not get fooled by this marketing strategy, as it is nothing more than empty promises. In reality, Assist Point is just one more adware program, which will make your life miserable as long as it is active on your PC. In addition to adware programs being infamous for causing annoyance and frustration, in some cases they could also act in a very suspicious way. For instance, you could be exposed to potentially malicious web content. This kind of activity promoted by Assist Point should not be tolerated, and the only way to stop it is to delete this intrusive adware program from your PC once and for all. During the research, we have discovered that Assist Point is a direct clone of adware programs such as Positive Finds, Strong Signal, and Roaming Rate. Therefore, it is not surprising that Assist Point functions in the same way as its counterparts. Usually, once this adware program enters your operating system, your browser will be filled ads and pop-ups. These will be presented to you whether you like it or not. The only way to stop this annoying activity is to thoroughly remove Assist Point. Do not click on any ads that Assist Point might present you with, even if they look extremely tempting, because we noticed ads with redirect links during the research. Ads with low prices are a trick used in order to make you click on them. By clicking on an ad, you risk getting redirected to third-party websites, which could host malware. This is an extremely dangerous situation, as you could end up with numerous malicious programs on your system. It should be more than obvious why the removal of Assist Point is a must. In order to reduce the risk of getting your PC infected with an Internet-based infection, you should take a few security measures. First of all download your software from official websites only, as third-party hosting websites usually provide bundle installers. In addition, make sure to pay the utmost attention while installing any software on your PC. Lastly, but most importantly, install a reliable malware detection and removal tool, which would provide overall security at all times. Follow the removal guide carefully, and you should not encounter any major problems. In order to make sure that every bit of Assist Point was removed, analyze your PC for potential leftovers. We provide a detailed list of files and registry entries associated with Assist Point along with the removal guide. Use this list while performing the analysis for potential leftovers. If you want to be sure that Assist Point was removed entirely, and you do not wish to check your PC manually, use a reliable antimalware tool for removal purposes. Select Assist Point and click Uninstall. Select Assist Point and click Remove. Right-click Assist Point and select Uninstall. Quick & tested solution for Assist Point removal.